Nothing beats freshly ground coffee beans, the aroma they give off is simply delicious. Here at Fresco Gourmet Coffee we sell all our coffee and flavoured coffee in beans, espresso, filter and cafetiere grind. If you are just starting out grinding your own coffee we thought we would put together a simple how to grind coffee beans guide. You can use a pestle and mortar, rolling pin and bag, or even a meat tenderising mallet to grind your coffee beans, but if we’re honest, they take time, make mess and using a proper grinder just makes it so much easier. The advantage of grinding your coffee means that your coffee will keep a little longer, beans tend to be fresher for longer. We sell electric and vintage grinders to grind you perfect blend, so let’s start with that what time of grind do you need? Burr coffee grinders crush rather than cut the coffee beans so you get a more even grind from a burr grinder. 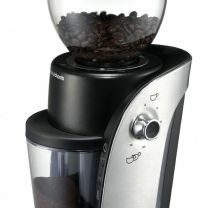 Our favourite is the Morphy Richards Arc Bean Grinder. These rely on manual work to grind the beans. Time consuming, but a quality grinder can produce an excellent result. As hand grinders do not heat up with coffee bean there is minimal impact on the flavour. Our customers like the control they have over the grind when using a hand coffee bean grinder, they also like the theatre and ritual involved! Our vintage grinder range starts are just £9.95 so they are really cost effective, they look great in the kitchen as well.